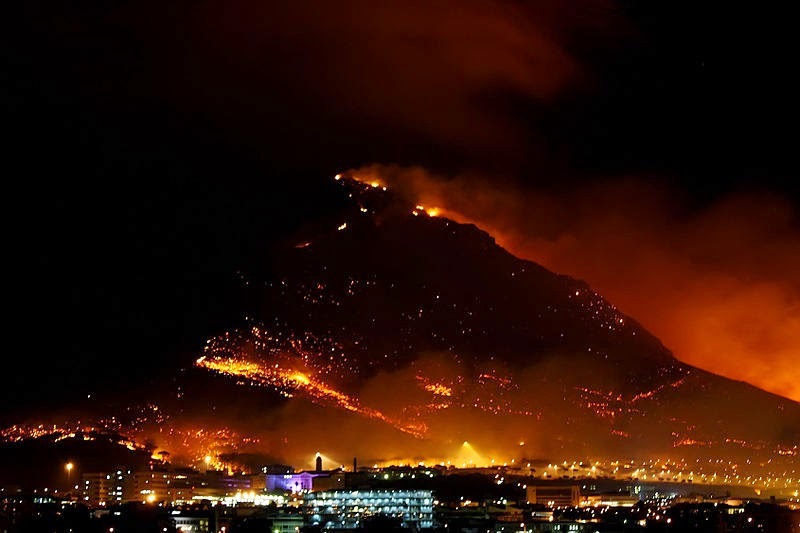 AllAfrica.com via SAPA: The Muizenberg fire that broke out over the weekend leading to hundreds of people being evacuated was under control on Thursday, Cape Town Disaster Risk Management said. "The fire is under control; we are currently dealing with hotspots in Clovelly and Constantia north," spokeswoman Charlotte Powell said. "The crews remained through the night and this morning [Thursday] helicopters will go out and inspect the area but currently the fire is under control." By Wednesday, a total of 500 people had been evacuated since the fire began. The fire started on Sunday and was contained, but flared up again just after 2am on Monday in Muizenberg above Boyes Drive. It was fanned by strong winds. It spread to Ou Kaapse Weg, Chapman's Peak, Hout Bay, and Tokai. One city fire-fighter sustained burn wounds and 52 frail-care residents from a Noordhoek retirement village were treated for smoke inhalation. More than 2000 people were helping to quell the fire on Wednesday, the environmental affairs department said at the time. This figure included 150 members of the department's Working on Fire (WoF) programme, spokesman Zolile Nqayi said in a statement.